I attended an ITAC Health hosted event this morning at which eHealth Ontario presented a 1st look at Ontario’s 2015 eHealth Blueprint. 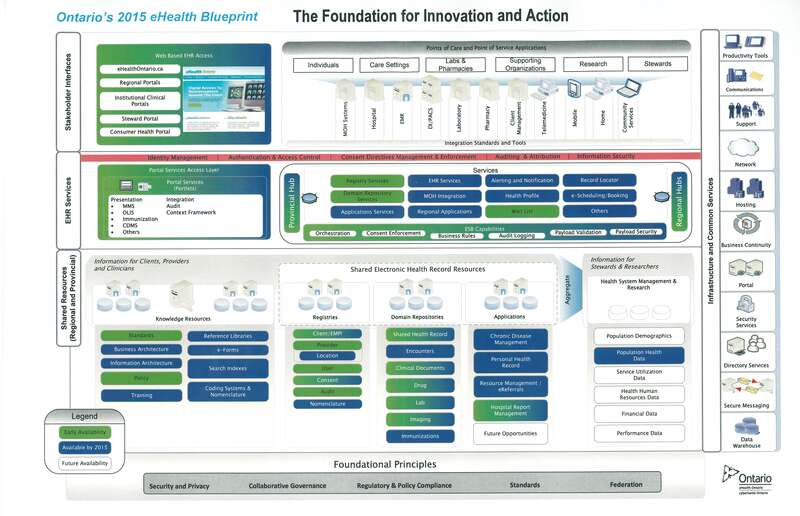 I’ll comment on what I heard in a separate post but, for now, I thought that I’d share a copy of a handout provided to attendees entitled “The Foundation for Innovation and Action”. ITAC Health is advising its members that Health Canada will be issuing a revised definition for “Patient Management Software” with respect to medical device licensing. According to ITAC Health, the new definition will be less restrictive than the definition contained in Health Canada’s 21 May 2010 notice on this subject. An FAQ addressing this matter is expected from Health Canada before the end of November. In case you weren’t aware, Greg Reed, the relatively new CEO at eHealth Ontario, will be presenting next week at an ITAC Health sponsored vendor information session. From what I can tell this presentation will be one of Mr. Reed’s very few public appearances since assuming his new role. Many people with whom I have spoken over the past few months have wondered why Mr. Reed has been so quiet. They tell me that they still feel largely in the dark about eHealth Ontario’s role and the status of an updated strategic plan for eHealth Ontario that Mr. Reed has promised on more than one occasion. I will be attending the ITAC Health vendor session next week. For those of you who don’t know me well, I am an independent consultant based in Ottawa and my trip to Toronto for the ITAC Health session will come out of my own pocket. I am making the investment because I want to hear, firsthand, what I hope will be a presentation on Mr. Reed’s vision for the future of eHealth in Ontario and the agency’s role in making this vision a reality. Many people have commented in various forums about the need for strong leadership and, whether he likes it or not, Mr. Reed is seen by these people as the Ontario eHealth leader. An article in today’s Toronto Star marks Mr. Reed’s return to the public spotlight but is short on details on how eHealth Ontario will deliver tangible results. I hope that I can share some more details on my blog next week after Mr. Reed’s presentation. Unlike many eHealth Ontario critics, I believe that eHealth Ontario has an important role to play in realizing the many benefits of integrating IT into healthcare delivery processes and that we can, with the right plan, realize a return on the investments made to date. I do wish, however, that Mr. Reed has been more open and transparent about the process to develop a new strategy so that we didn’t feel so in the dark about what has been going on at the agency for the past six months.